Just 8 minutes start to finish to make this air fryer low carb keto shrimp scampi. So simple to make, so delicious, you won’t believe it. 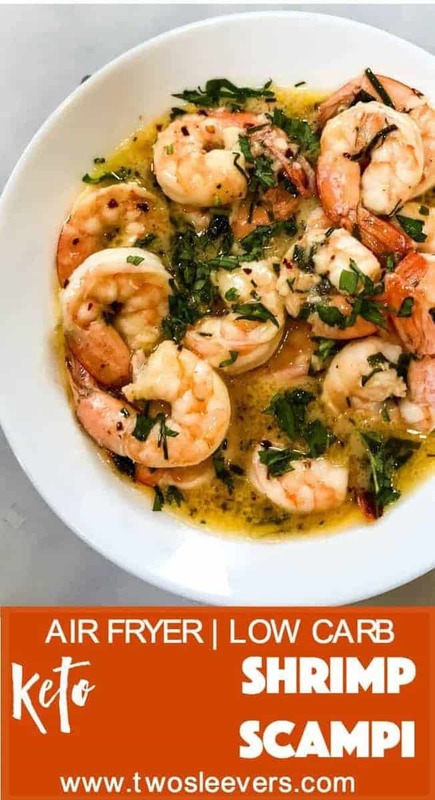 Watch the video at the end on how to make this Keto shrimp scampi in your air fryer. What could I possibly say about Shrimp Scampi that hasn’t already been said before? Probably nothing. Except that this one has no wine, lots of butter, garlic, and flavor, and I made it in an air fryer. At this point, you’re probably asking yourself, how do I make shrimp scampi in an air fryer? In a pan is how. 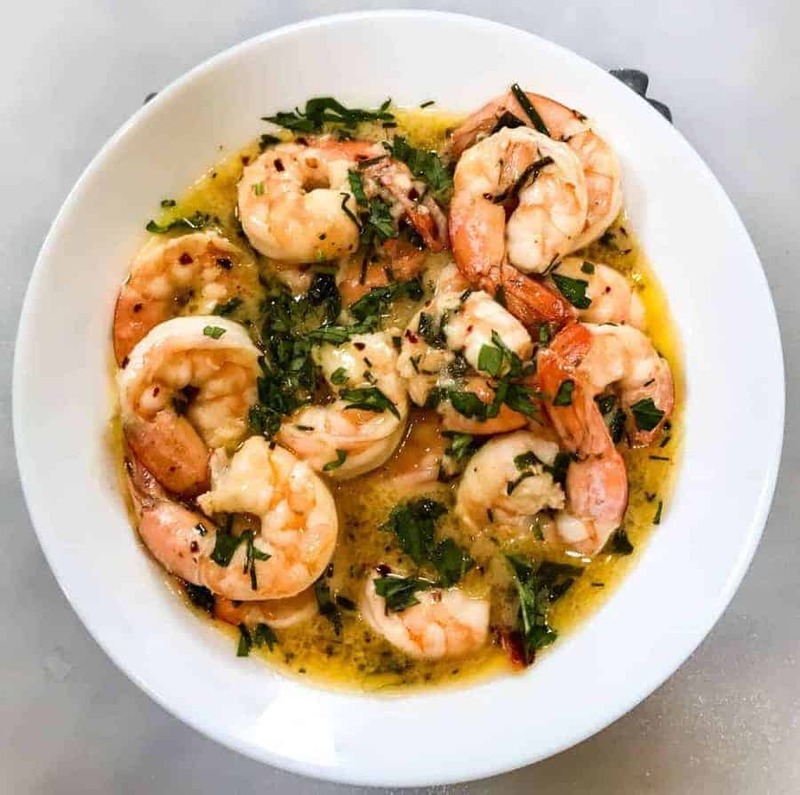 Of course, you could make this very same Keto Shrimp scampi in an oven, or on the stovetop. You’d follow almost the same cooking directions, but I liked making this Shrimp scampi in the air fryer for three reasons. It was super fast. 8 minutes. Just follow the exact order I list to get the most efficient workflow because yes, workflow in cooking is a thing. It didn’t heat up my whole kitchen. There were zero splatters anywhere on my kitchen counter. So if you’re wondering if the world really needs YET ANOTHER Shrimp Scampi recipe, I think it might need an air fryer shrimp scampi version! I know it may feel a little different to eat shrimp scampi without pasta, but that’s why we have zoodles and mashed cauliflower in this world. Or if carbs are not an issue, you can do pasta of course. 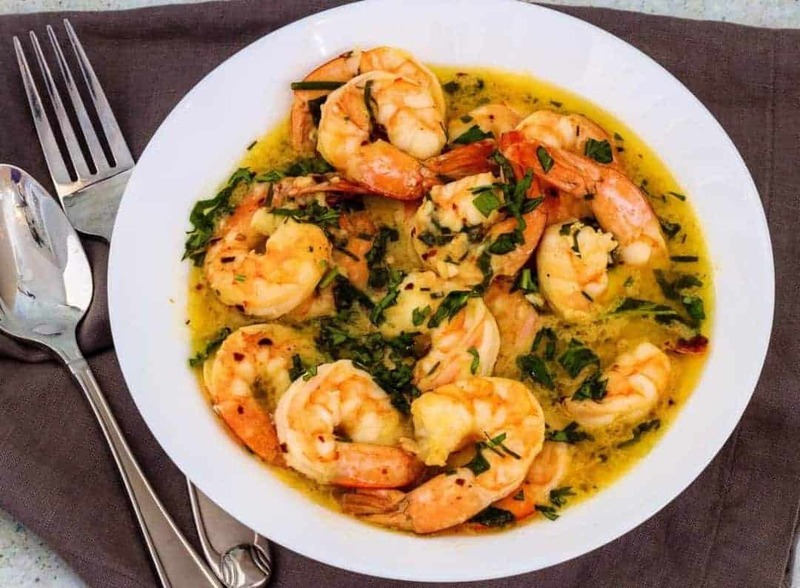 By the way if you want to make a shrimp scampi in your Instant pot or pressure cooker check out my Instant pot creamy shrimp scampi recipe here. 8 minutes start to finish to make this air fryer keto low carb shrimp scampi. So simple to make, so delicious you won’t believe it. Turn your air fryer to 330F. Place a 6 x 3 metal pan in it and allow the oven to start heating while you gather your ingredients. Place the butter, garlic, and red pepper flakes into the hot 6-inch pan. Allow it to cook for 2 minutes, stirring once, until the butter has melted. Do not skip this step. This is what infuses garlic into the butter, which is what makes it all taste so good. Open the air fryer, add all ingredients to the pan in the order listed , stirring gently. Allow shrimp to cook for 5 minutes, stirring once. At this point, the butter should be well-melted and liquid, bathing the shrimp in spiced goodness. Mix very well, remove the 6-inch pan using silicone mitts, and let it rest for 1 minute on the counter. You’re doing this so that you let the shrimp cook in the residual heat, rather than letting it accidentally overcook and get rubbery. Stir at the end of the minute. The shrimp should be well-cooked at this point. Sprinkle additional fresh basil leaves and enjoy. If using frozen shrimp, you will need to cook for longer. I haven't tried it with frozen shrimp, so, unfortunately, I can't tell you how much longer. If you're allergic to shrimp, you could try with bite-size chicken pieces, and check at the end of the cooking period to see if it needs longer. To make this vegetarian, you could make the same sauce and mix it with drained, canned chickpeas. You could also try lightly steamed cauliflower or broccoli in this sauce. If you want to make a shrimp scampi in your Instant pot or pressure cooker check out my Instant pot creamy shrimp scampi recipe here. Just 8 minutes start to finish to make this air fryer low carb keto shrimp scampi. 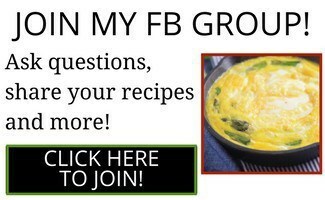 So simple to make, so delicious, you won’t believe it. What’s more, only one pot to clean. I love one pot meals! Thanks a lot for this amazing and delicious recipe! I love shrimp and this one was very good! 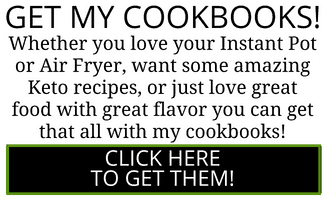 A minor typo in the print format title for Airfyer Keto Shrimp Scampi–Not Airfyer. 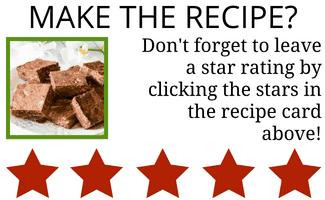 Thanks, the recipe looks delicious. I’m just waiting for my pan to arrive. This is delicious – whole house approved! Didn’t have a pan that fit my air fryer, so I made it on the stove top. I made twice as much sauce and used a pound of jumbo wild-caught blue shrimp from Trader Joe’s. Served with sauteed zucchini, but it would have been amazing with pasta. For a flavor similar to Cheesecake Factory’s scampi sauce, use the white wine! My husband LOVED this meal! I will be cooking with half the spice next time and be giving him extra. I thought it was a little spicy. This was so good! We plan to cut the red pepper flakes in half next time, but even with more heat than I usually eat, it was amazing. Urvashi – any thoughts on making this with scallops? Omg it would be AMAZING w scallops! This Shrimp Scampi is fast easy and AMAZING!!!! !